Redleaf Serviced Apartments – Wahroonga, Sydney. Redleaf Serviced Apartments are a short walk to the quaint village of Wahroonga where there is a wonderful variety of specialty food and boutique shops, cafes offering great food and beverages, medical facilities, a train station, chemist, post office and much more. Living independently is important to most people and in serviced apartments like Redleaf, residents can continue their independent lifestyles with experienced twenty four hour care on hand at all times should it be required. If they choose, residents can escape the day to day chores of cooking, cleaning and heavy laundry. The central kitchen of Redleaf provides delicious and nutritious meals served in an elegant dining room for both lunch and dinner with a continental breakfast served in the apartments enabling residents to start the day at their own pace. There is a small well-equipped laundry for personal washing. Three beautifully appointed lounge areas are available, one on each floor for residents to gather together or relax and entertain family and friends. Each of the three levels are accessible by lift. Maintenance staff care for all external maintenance and the gardens are tended to allowing residents more time for the things they really want to do. Off street parking is available for residents and their guests. Hillcrest Serviced Apartments – 1A Railway Crescent, Stanwell Park, New South Wales. Hillcrest Serviced Apartments are within the Hillcrest Retirement Village located at Stanwell Park and set amongst 4.7 hectares of rolling bushland amid landscaped grounds. Set in a truly beautiful coastal location complete with ocean views the apartments are located below the escarpment in Stanwell Park and moments from the beach and only an hour from Sydney. The four serviced apartments are a unique option and can be personally tailored to suit your needs. You can live privately and independently in your apartment whilst receiving the benefits of hotel-style services including daily meals, weekly linen and domestic services and a 24-hour emergency call system for peace of mind. If you need extra help with showering, dressing, medical management and allied health services you can choose from a range of optional user-pays care services. All apartments have 2 bedrooms with an ensuite and bathroom, open plan living, large kitchen, laundry, basement car parking and private outdoor access. 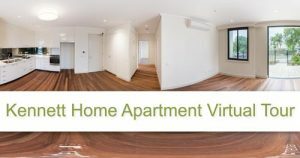 Click on the thumbnail below and enjoy a virtual tour of one of these lovely apartments. Hillcrest Serviced Apartments are living at its best. These stylish and ultra modern apartments have been architecturally designed and come with all the safety features one would expect in a retirement village. Contact Hillcrest Apartments today to arrange a tour and “take care of your tomorrow”.